Mountains cover the majority of land in Japan, and forests spread across 70% of the country’s land. Much of Japan’s society, culture, and traditions are rooted in the mountains and forest. Japan is a mountainous country, which explains why in 2016, the national holiday, “Mountain Day” was established. On the other hand, Japan is also a marine nation surrounded by the ocean. These natural features are reflected in the widespread research and education conducted throughout Japan in Forest Science and Marine Science. Although the mountain areas are often the subject of research and education at individual research labs at universities and research organizations, it cannot be denied that an adequate system of research and education for the comprehensive exploration of mountains does not currently exist. 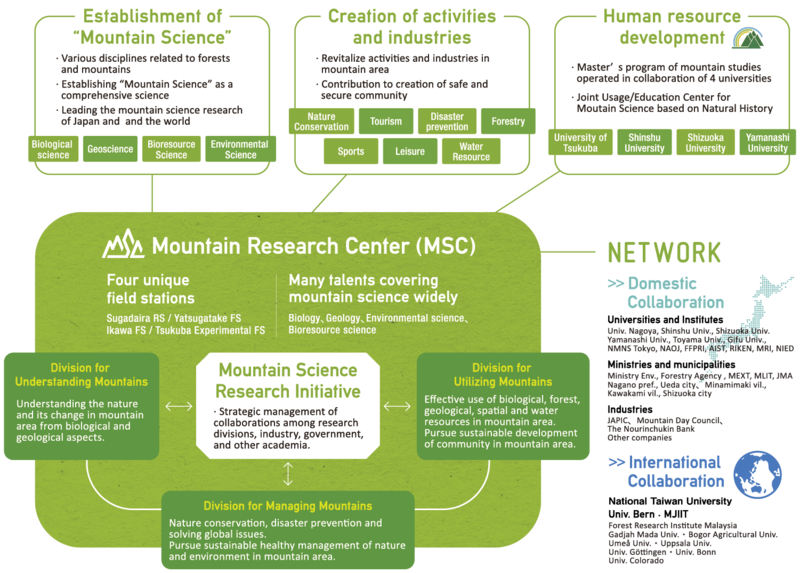 For this reason, at the University of Tsukuba our aim is to establish a study of Mountain Science that spans science, agriculture, and engineering. Somewhere significantly higher than its surroundings, somewhere with a high elevation, somewhere with a substantial slope. There are many definitions. According to these definitions, 20 – 30% of the world’s land surface is mountains, and it is said 10 – 20% of the world’s population lives in the mountains. There is an even larger population downstream from mountains, and the people who live here are affected by both the gifts and the disasters that the mountain brings. Hearing the word “mountain” may only evoke thoughts of lofty and steep mountans, but at the Mountain Science Center at the University of Tsukuba, we think of the mountains intimately intertwined with our lifestyles in a broad sense, and cover what people familiarly consider mountains as well as everything from the mountain’s summit to its foothtills, satoyama, which is the area between the foothills and arable flatland, and forests. Mountains are formed in the earth’s foundation (geosphere), and there are a wealth of creatures living there (biosphere) that are intricately involved in people’s lives (anthroposphere). It is said that half the world’s people are reliant on moutain resources. In the mountainous country of Japan, the proportion of people who depend on the mountains is even higher. Looking across the mountain from its summit to its foothills, we can find water and other resources flowing here, and there are dramatic changes in its environment, including the temperature. Thinking of mountains as this kind of system and exploring its connection to the geosphere, biosphere, and anthroposphere, will give us a proper understanding of mountains and how to maintain them appropriately. This will also lead to utilizing the mountains’ gifts and avoiding its disasters. We are aiming to establish Mountain Science as the academic field exploring mountains in this comprehensive manner. In mountainous areas, a number of issues arise, including a decrease in biodiversity, disasters from heavy rainfalls, heavy snowfalls, and sediment movement, foresty stagnation, aging populations and depopoulation of mountain villages, decline of upland communities, and damage from animals, and these issues are all complicatedly intertwined. Resolving them is also a task for Mountain Science. In the mountain-rich country of Japan, these issues stand out acutely. Finding the remedy for these urgent issues will lead to resolving the world’s mountain issues as well. 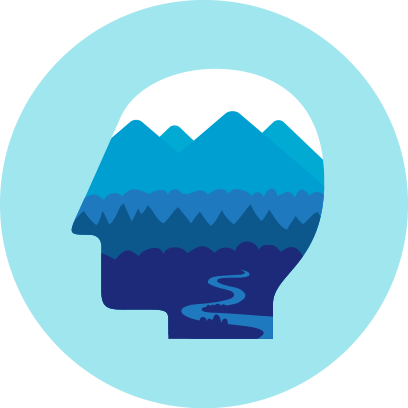 We will establish the field of Mountain Science to comprehensively explore mountains from the perspective of the geosphere, biosphere, and anthroposphere across the fields of science, agriculture, and engineering. MSC was founded in April 2017, by combining Sugadaira Montane Research Center (since 1934) and the forest section of Agricultural and Forestry Research Center, consisting of Ikawa forest (since 1962), Yatsugatake forest (since 1949), and Tsukuba Experimental Forest (since 1973). 37 faculty members (as of March 2018) spanning the fields of biology, agriculture, earth science, and environmental science teach here. Many faculty members in Tsukuba Campus at the University of Tsukuba also concurrently teach here. The following three points are the main purposes of the Mountain Science Center. Establish the academic field of Mountain Science to comprehensively explore the relationship between mountain environments and human activity from the perspective of the geosphere, biosphere, and anthroposphere and lead Japan and the world in Mountain Science research. Achieve environmental conservation, disaster prevention/reduction, and economic revitalization of mountainous regions and communities and contribute to the creation of safe and secure communities through the cooperation of industry, government, and academia. 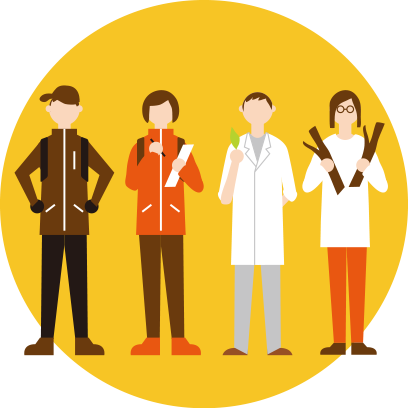 In addition to a Master’s Program specializing in Mountain Science promoted through the cooperation of four universities (University of Tsukuba, Shinshu University, University of Yamanashi, and Shizuoka University), foster talent well-versed in Mountain Science who can solve the numerous issues involving mountainous regions and communities. 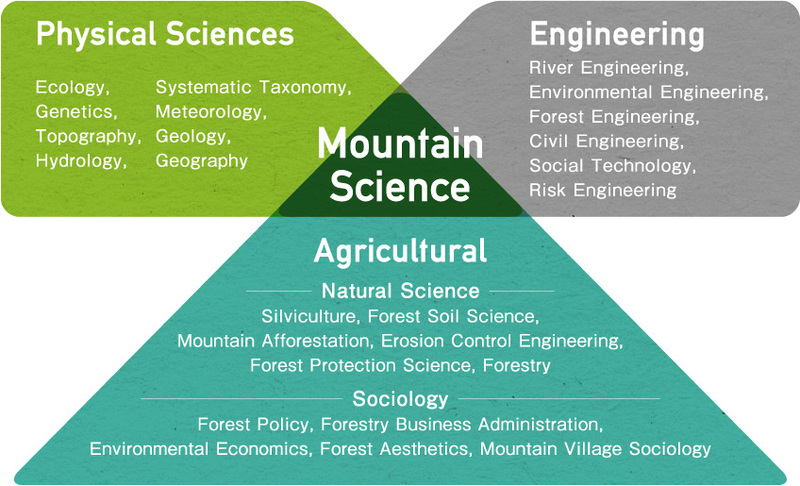 We have established research departments for each research solution (understanding of mountains, sustainable mountain maintenance, mountain usage) rather than existing research departments, and we are promoting Mountain Science research through the fusion of research departments. Establishing the Mountain Science Research Initiative to strategically build a cooperative relationship between research departments and within and outside the university, will lead to the smooth development of regional collaborations, industry-government-academia collaborations, and international and domestic joint research endeavors. Mountain Science, the study of mountainous areas and forests that account for 70% of the land in Japan, is still in the process of being formed. We are establishing Mountain Science as a comprehensive science and will lead the world with outstanding research. 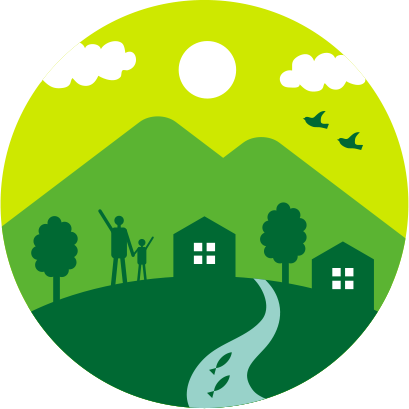 We are contributing to the creation of safe, secure, and healthy communities through the revitalizaiton of a variety of work in mountainous areas and communities in areas such as forestry, tourism, disaster prevention and reduction, water resources, and sports, and the creation of mountain jobs. We are developing research and education that make full use of the alluring fields of the Sugadaira Research Station, Yatsugatake Forest Station, Ikawa Forest Station, and Tsukuba Experimental Forest, which comprise the Mountain Science Center.